The National Parks State Quarter program is a circulating commemorative United States quarter-dollar coin series that began in 2010. 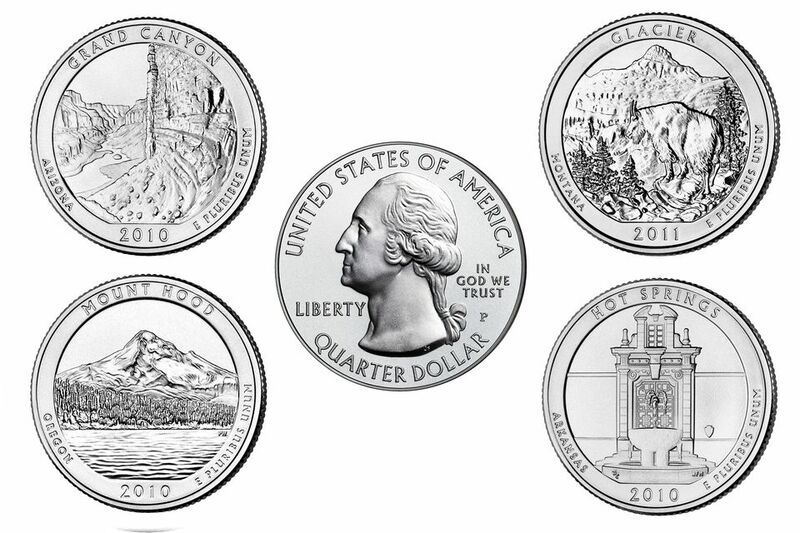 The program is officially known as the America the Beautiful Quarters®. The Treasury Department modeled the series on the hugely successful 50 State Quarters® Program. The U.S. Mint will issue the quarters at the rate of 5 coins per year for 11 years, producing one National Parks Quarter for each of the fifty state, plus Washington, D.C. and four territories. The legislation which created the National Parks Quarters bill, HR 6184, is formally titled America’s Beautiful National Parks Quarter Dollar Coin Act of 2008. It was introduced by Rep. Michael Castle (R-Delaware) who has long been a proponent of important coin legislation. It was Castle who sponsored the original 50 State Quarters bill. One Site Per State - Each state must choose one location of "natural or historical significance" to be featured on their coin. The selected site doesn't have to be a national park despite the bill's title. 270-Day Determination Period - The Secretary of the Treasury must consult with the Secretary of the Interior and the governor of each state to determine each state's national park or historic site within 270 days of the National Parks Quarters bill's enactment. The purpose of this predetermination of sites is so that the order of coin issuance can be established for the entire 11-year period. Order of Issuance - The United States Mint will issue each National Parks State Quarter in the order that the sites were declared to be National Parks or National Historic Sites. The first coin issued in 2010 featured Hot Springs National Park in Arkansas. Program Renewal - At the discretion of the Secretary of the Treasury, but no later than the ninth year of coin issuance (in 2018), the National Parks Quarters program may be extended for another 11-year cycle. If the program is extended, it must run until every state has had a second site featured on a coin. Although the National Parks Quarters legislation doesn't explicitly state this, The Secretary of the Treasury can reject designs which are controversial. The United States Mint's design process is very similar to that which was used for the 50 State Quarter and Presidential Dollars. Briefly, the process requires the states to create a short design narrative, which is then assigned to several artists who produce coin designs based on the description. The states then choose the finalists, which are vetted by various commissions. The Treasury Secretary makes the final choice after considering everyone's input. While the National Parks Quarters bill is scant on the details for how the design process should work, it does stipulate that three parties should review the proposed designs. These parties are the Secretary of the Interior, the Commission of Fine Arts, and the Citizen's Coinage Advisory Committee. The bill provides for the issuance of numismatic, or coin collectors' versions, of the National Parks State Quarters. The U.S. Mint is authorized to strike collectors' versions of the standard coins in Uncirculated and Proof finishes, plus versions in 90% silver. The law also imposes some strict requirements regarding when the U.S. Mint may sell these five-ounce silver coins. They cannot go on sale before January 1 of the year in which their circulating counterparts are being issued, and the U.S. Mint will not sell them after December 31 of that same year. The bill also has a provision for the Director of the National Park Service to be able to buy the 5-ounce coins directly from the Mint for resale in National Parks gift shops.